After a wild tournament at THE TURN, it’s time to get back to the regular season of the NBA 2K League. There are some heavyweight bouts with a solid undercard in week five, which makes for an always interesting set of league matches. Here are four questions heading into the week. 1. Will teams upset at THE TURN bounce back? Three higher-seeded teams lost in the first round of THE TURN last weekend: Pistons GT, Cavs Legion GC and Jazz Gaming. Pistons GT fell to Warriors Gaming after switching out ixsplashkingxi for JosephTheTruth, Cavs Legion and Hood had trouble adjusting after his return to the lineup against Knicks Gaming and Jazz Gaming fell to the red-hot CLTX Gaming. As I mentioned in my TURN review, I wouldn’t place too much stock into bad performances at any of the league’s tournaments. In the grand scope of things, they hardly matter (unless you like the chance to win some extra cash). But that doesn’t necessarily mean that a first round loss won’t have an adverse effect on any of these teams. And it could particularly affect Cavs Legion. 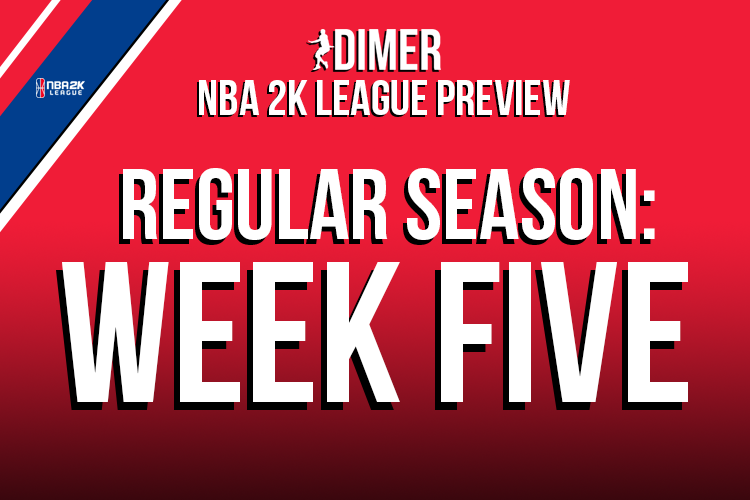 They face both Pistons GT and Mavs Gaming in week five, and losses against both would mean a four-game losing streak dating back to week four. They have Hood back, but it’s no guarantee that he’ll be the star he was at THE TIPOFF after such a prolonged absence from the team. Jazz Gaming, meanwhile, has a tough matchup against Wizards District. The Jazz are on a two-game losing streak and another loss in week five would put them at 3-3, a record that’s nothing to be concerned about at this juncture but one that wouldn’t reflect the quality of the team. 2. Can CLTX Gaming carry momentum from their surprising TURN run? A three-game regular season losing streak somehow turned into the 11-seeded CLTX Gaming making a run to THE TURN finals while beating Jazz Gaming, Mavs Gaming and 76ers Gaming. The crucial part of this is for the team to turn that into regular season success. A lineup switch of subbing out PalmOilPlease in favor of Speedbrook at THE TURN could end up being the spark to a potential turnaround in Boston. A week five matchup against struggling Bucks Gaming is only good news for the side as well. Confidence should be high for this team, it’s just a matter of capitalizing on it. 3. Can 76ers Gaming stop Blazer5’s run? It’s the third matchup between the two teams this season. Blazer5 Gaming got the better of the 76ers in group play of THE TIPOFF, but 76ers Gaming got revenge in THE TIPOFF title game. That loss in the finals is the only blemish on Blazer5’s season. Since then they’ve won eight straight games and have a tournament title of their own. Not only do they look nearly unstoppable, but 76ers Gaming has had some struggles in the last few weeks where they lost to Raptors Uprising and barely escaped against Wizards District with a one-point win, both times having their usually excellent shooting go cold. Many expected these two teams to meet again in the finals of THE TURN, but 76ers Gaming fell to CLTX Gaming in the semi-finals. So Blazer5 is hot, and the 76ers are still one of the best teams in the league but they’ve had recent issues. Undoubtedly, though, both teams will be hungry for a win in an attempt to claim status as top dog in the league. 4. Can teams at the bottom of the league pick up some wins? While some of the league’s best teams will duke it out in week five, those at or near the bottom have the opportunity to grab a win. No game in this league is easy to win, but it sure is easier to win against a team in the middle of the league than it is to win against a top team. Starting from the bottom of the standings, Pacers Gaming plays Knicks Gaming, Raptors Uprising plays Kings Guard, Grizz Gaming and Warriors Gaming play each other and Bucks Gaming plays both CLTX Gaming and Magic Gaming this week. Like I said, no game is easy! But the middle tier of the NBA 2K League is characterized by inconsistent teams that are prone to losing games they probably shouldn’t. Week five is about as good a time as any for those at the bottom to attempt a comeback and begin their campaigns to make the playoffs in earnest.